The site discusses methodologies that reduce the cost of spacecrafts by 95%. It offers solutions that will make spaceships safe, practical and economical. It presents new ways to achieve low earth orbit. The purpose of this site is not to raise money or form a company. The purpose is to start a discussion about what is possible and practical. We often do things a certain way, simply because that’s how we have done it in the past. Our methods for going into space have certainly followed this pattern. Since space travel is an extremely complex and dangerous endeavor, it is often too risky to even consider taking a different path. That’s why NASA spacecrafts look amazingly similar to the spaceships of 50 years ago. Only the NASA Space Shuttle offers a different appearance, but even the Space Shuttle used the same old rocket engine technology. This conservative approach to space travel has limited our progress. While other sciences have dramatically advanced over the last 50 years, our methodologies for going into low earth orbit are basically the same, the brute force of rocketry. We have only made small incremental changes to a fundamentally expensive approach. The inefficiency of our current rocket-based space launch system is rooted in the fact that it carries too much fuel. Eighty percent of the weight of a rocket is the oxygen fuel. This is a travesty since the rocket burns the majority of this fuel while it is still traveling through the atmosphere, which contains oxygen. An air-breathing propulsion system which uses atmospheric oxygen could result in amazing weight savings. Eliminating most of the oxygen fuel weight will result in the ability to also dramatically reduce hydrogen fuel and structural weight. The goal will be to alter the flight plan (envelope) to remain in the upper atmosphere longer until the spacecraft has achieved a speed of Mach-10, hopefully Mach-15 as technology allows. NASA has already tested an experimental air-breathing scramjet that reaches Mach-9.8, the NASA X-43A. A low cost design for a practical Mach-15 engine has remained elusive. However, the book related to this web site provides details of how a Mach-15 engine can be built. Further, this book describes several other concepts that will reduce cost, including a unique reentry system and other techniques to make the spacecraft reusable and less expensive. The book, “What If We Made Space Travel Practical?”, endeavors to provide details regarding practical solutions. The termination of NASA Space Shuttle launches and the end of the space shuttle program has cause human spaceflight to at least temporarily be dependent on the Russian Soyuz space ships. In order for future human spaceflight programs to continue a new manned spacecraft must be developed. As shown on NASA TV, which can be found on NASA.gov, NASA is depending on private companies to provide an economical solution for a space launch vehicle. Certainly the SpaceX Company has shown its ability to provide such a practical and safe launch vehicle. However, Space X’s Dragon spacecraft has not yet been approved for manned spaceflight. Other private space companies including, Sir Richard Branson’s Virgin Galactic, Jeff Bezos’ Blue Origin and the Mini Space Shuttle program have issues that make them less than ideal for the next generation of space launch vehicles. The primary issue is that these programs remain too dependent on lugging their own oxidizing agent with them instead of using atmospheric oxygen. This dependence on lugging the heavy oxidizing agent internally to the space ship, dramatically adds weight and reduces efficiency. The Star Horse Project attempts to correct this wastefulness and provide a practical and economical space launch system. 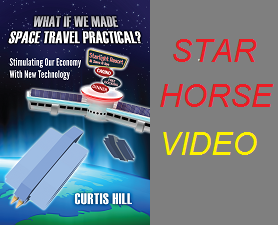 The book, “What If We Made Space Travel Practical?”, provides details of how the Star Horse Project could make space travel practical. The concepts and applications proposed and described here and in the related book are the inventions of the author and are protected by their patent pending status at the time of this publication. I wish to stress, however, my paramount concern is to prevent others from filing patents that could block development of these concepts and not simply my personal financial gain. Developers truly devoted to pursuing these concepts will find me to be a willing partner. Copyright © 2012 by Curtis Hill. All Rights Reserved.